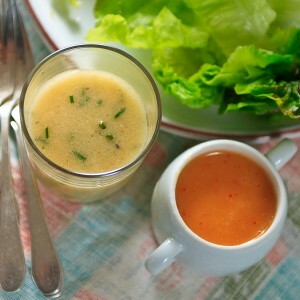 French Vinaigrette (left) versus American “French” Dressing (right). Photo by Richard Swearinger. Here’s a recipe for French vinaigrette. It’s a classic French vinaigrette recipe I’ve been making for years. My introduction to a classic French vinaigrette came during my first trip to France, when I stayed with the Lavigne family in Burgundy, and Madame Lavigne would make her vinaigrette salad dressing at the dining-room table. I’d watch as she’d crush the garlic with the salt and pepper, add the vinegar—and of course the Dijon mustard (Dijon is in Burgundy, after all)—then whisk in the oil, never with measuring spoons, but with a careful eye and a steady hand. While she was justifiably proud of her vinaigrette recipe, I don’t think Madame Lavigne made the dressing in front of us to show off. Rather, she wanted to make a fresh vinaigrette, but also wanted to be part of the ongoing fellowship at the table rather than stuck in the kitchen. She also wanted to make sure her salad was dressed just seconds before she served it. Put the garlic into the bowl in which you will eventually serve the salad. Add the salt and pepper (keeping in mind that this will be the seasoning for the salad) and use the back of a spoon to make a rough paste. Add the vinegar and whisk until the salt is dissolved. Whisk in the mustard. Slowly add the olive oil, whisking until incorporated. Whisk in the hot pepper sauce, if desired. PS: If you’ve enjoyed this recipe and you’d like to help support this site, simply go to Amazon.com through one of my links or banner ads (such as the one below). No matter what you buy, I’ll get a small commission from your purchase, and it won’t add to your cost whatsoever. Thanks for your consideration. how long can this dressing be kept? how should i store it? Hi Jane. Thanks for asking. Cover and store the “American” French dressing for up to 2 weeks. The vinaigrette is best the day it’s made. However you can make it an hour or so in advance and just leave it on the counter until you’re ready to toss the salad (it will be fine up to 2 hours). I do that when entertaining. If you do have leftover vinaigrette, you can put it in the fridge for a week or so, but bring it to room temperature before using, because the olive oil will have solidified. How delicious a presentation of Chef’s Salad? L’assiette froide, oeufs dur mayonnaise,from a ready-made piping tube,no less. C’est interessant comme recette je l’ai déjà testé auparavant!